One of the most significant elements in building the right home is finding the right floor plan. When it comes to the right floor plan, however, there’s no such thing as one size fits all. What’s important for a young family starting out isn’t necessarily important for more mature owners. So what are some elements that contribute to the best floor plan for empty nesters? Regardless of what your needs or personal sense of style, one element remains constant: Value. When we’re talking about value, we’re talking about a lot more than just price. You’ll want to be sure that you’re getting the most house and the best quality house for your money—regardless of what you spend. And while upgrades can be great additions to a new home, it’s important to remember that “high-end” doesn’t always equate to high value (Here’s an article that explores that concept in more depth). Keep comfort, convenience, and safety in mind as you choose your new home. If you’re an empty nester, things have changed regarding your housing needs. Not only do you probably not need as much space (since the children are gone), but you probably also don’t need (or want) the hassle of maintaining extra rooms that don’t get much use. That’s one reason we offer a number of floor plans that offer plenty of space for comfortable living—without the extra space you don’t need. Our Linsley floor plan (shown here) is a great example of that. It offers a Master bedroom with bath and two additional bedrooms that share an adjoining bathroom. One bedroom could be a home office or a craft room—leaving you with full-time guest room for any time you need it. Everything in this floor plan is on one level. Taking stairs out of the equation is something you may appreciate in the future. Beyond that, having everything on one level is so convenient. You’ll still have plenty of space in the open kitchen/dining area and great room whether you’re entertaining, or simply enjoying a quiet evening at home. There are even three porches where you can enjoy a morning cup of coffee or a drink in the evening. There's even a drop area just off of the garage entry to your home—making unloading groceries or other items a breeze. Click here for a larger image of the Linsley floor plan. Not only is a somewhat smaller home more convenient and less work, but it's also easier (and less expensive) to heat and cool. 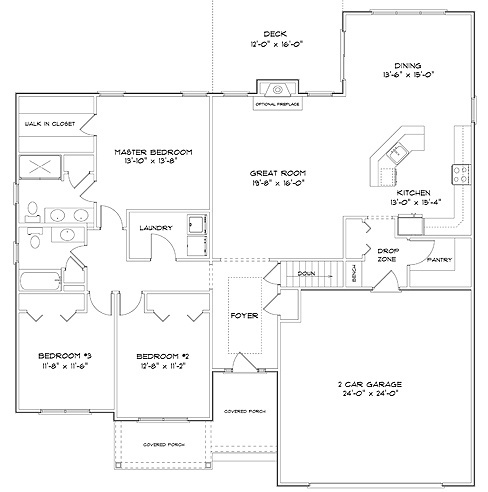 The Linsley floor plan shown above is 2,250 square feet. 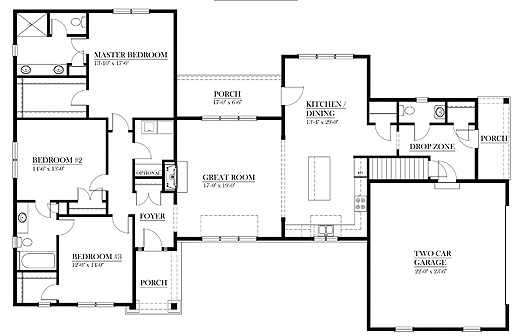 The Woodford floor plan (shown here) is similarly laid out but is slightly smaller at 1,965 square feet. It also features three bedrooms (a Master and two additional bedrooms). The laundry room is conveniently located right off of the Master bedroom. The Woodford also offers a spacious deck off the back of the home that's ideal for entertaining, or simply enjoying some alone time outside. You'll notice that the kitchen/dining room/ great room is in a slightly different configuration—but still offers ample open space. In both homes, this use of open space makes them feel even more spacious. Click here for a larger, more detailed look at the Woodford floor plan. Empty nesters looking for comfort, convenience, safety, and a slightly smaller footprint (with less space to maintain) will enjoy either of these two home plans. And of course, any of the floor plans we offer can be customized to your specifications, whether we build your home in one of our elegant communities, or on land you find on your own.